Hi! 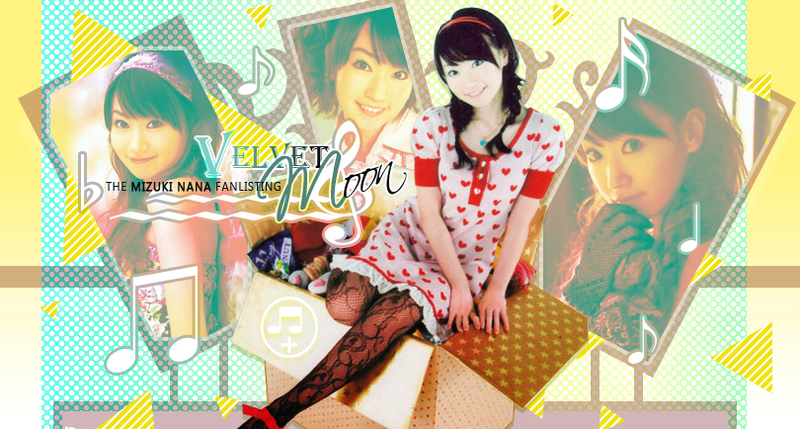 Welcome to "Velvet MOON", the TFL approved fanlisting dedicated to the amazing and absolutely sweet japanese voice actress Kondo Nana, better known as Mizuki Nana! Nana's voice is sweet and her song are intense and full of love! They're a part of her and her interpretations can touch the heart of everyone, definitely, she's a prodigy that NEEDS a fanlisting! Her most representative roles are Hyuuga Hinata from Naruto, Akashiya Moka from Rosario to Vampire, Hoshina Utau from Shugo Chara! and Colette Brunel from Tales of Symphonia! For more info, please, visit the proper section and feel free to take a look around! Please, choose a link from above to fully access the site, and if you're a fan of Mizuki Nana, feel free to join her fandom! This is a fan-site, do not reproduce without permission.